When people hear that I run a lot of marathons and half-marathons, they have one of two reactions – they think either I am crazy or an extraordinary athlete. Among the people who think I am insane is Frank Shorter, 1972 Olympic Marathon Gold Medal winner. I met Frank in December 2012 at the Expo for the Rock n’ Roll Las Vegas Marathon/Half Marathon. Frank asked me if I was running the race. I told him I wasn’t because I had already run 8 half marathons and one full marathon that year. His jaw dropped. When he regained his composure, Frank told me I was crazy to run that much. It was not, he said, something that he would do. He shook his head and walked off. Not too often that you can shock an elite runner. I find the people who think I am some super athlete to be amusing. Truth be told, I was always among the last ones picked for any team in school sports. The only way you would have described me in terms of athlete would be to put “not” before it. I was not an athlete. I am not crazy and I am not an extraordinary athlete. I started running to show support for a friend battling lymphoma. But when I started having episodes of paralysis and constant neuropathy, running became the only thing I wanted to do. Funny how the threat of losing something makes you want it even more. My diagnosis of Transverse Myelitis (TM) permanently changed my perspective. While my condition is under control – no episodes of paralysis and no neuropathy – I never know if a day will come when running is something I won’t be able to do. I run because I can. A long time ago I found a blog written by a Canadian female runner who also has TM. She is planning to run a marathon in each of the 10 Canadian provinces – she only has one more to run. During one of her races, her paralysis returned. She was able to finish the race but it was a frightening moment. Her doctor later explained that she experienced Uhthoff’s phenomenom where her TM symptoms worsened due to the high temperatures during the race and her increased core body temperature. Reading that was sobering. I had never heard of Uhthoff’s phenomenom. I knew that I felt worse when I got hot, even a fever can trigger my neuropathy, but I never knew that it had a name. I also understood why my neurologist, Dr. T., yelled at me when I told him I planned to run Rim-to-Rim in the Grand Canyon. He feared that the excessive heat would cause me to have life-threatening issues. I was blessed the day I did the Rim-to-Rim. The temperatures were only 84 degrees at the base of the Canyon (normally over 100 degrees) and I had no TM-related issues. I am very careful when I run in the heat and I have many coping mechanisms including running with ice wrapped in a scarf around my neck. At my last check-up, Dr. T told me about his cousin – a vibrant man in his 40s who ran marathons, competed in cycling events and triathlons. His cousin was in a tragic bike accident during a race caused when the tire blew out on another cyclist’s bike. After spending several days in a coma, Dr. T’s cousin regained consciousness but sadly will never be able to walk again. Dr. T looked at me and told me to keep doing what I am doing. He understands that at any time the music can stop for any one of us and we can find ourselves sitting. Running is keeping me healthy. Movement is good. At the start line of any marathon, triathlon, or even century bike ride, you will find people like me, fighting against something that wants to take away our gift of movement, or maybe even our life – cancer, MS, TM, epilepsy, or a host of other physical challenges. We aren’t crazy or super athletes. We are just wringing every bit out of life while we can. 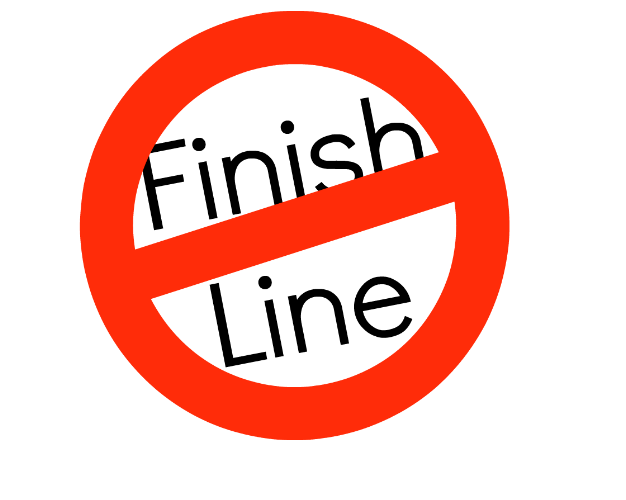 For us there is no finish line. Brian Warnecke is an incredible young man who loves to play hockey and dreams of being the first person with Cystic Fibrosis (CF) to play on the USA Olympic hockey team. Brian also likes to bike. In 2014 he rode 1,065 miles in 43 days over 8 mountain passes and raised $260,000 for CF research. Brian does this to thank the Children’s Hospital of Colorado “for keeping [him] healthy and to encourage other kids with disabilities to remain physically active and pursue their dreams.” You can read more about Brian at his web site pinklightning.org. OneRepublic made this terrific video for their song “I Lived” featuring Brian. It says it all.